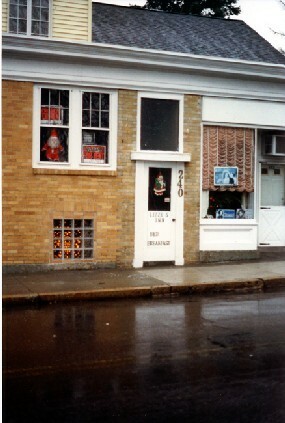 Over the decade of the 1990’s, several enterprising homeowners and business people entertained the notion of cashing in on the Lizzie name to open businesses around town. The Lizzie Deli on Third Street (which is now the Lizzie Bldg office space) did a rip-roaring business in “Lizzie Burgers”- rare hamburgers served up with a lot of ketchup in the demure, lace-curtained Victoriana-decor eatery. 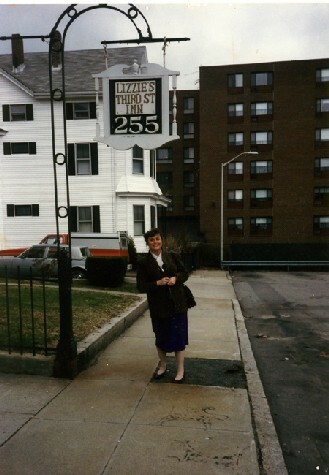 Just next door to the scene of the crime, a Lizzie B&B sprung up about 5 years before #92 opened its doors for business, and on Third Street, in what would have been 1892’s Crowe’s Yard, another rambling old house hung out their B&B sign. The great thrill was when , in 1996, Ron Evans and Martha McGinn opened Second Street to the wildly curious, and soon after Maplecroft jumped on the booming business to be made on Lizzie. Today the only one still going strong is #92-but someone someday will find another clever idea on the Lizzie theme!